That's my mantra and it's particulary relevant during travel. Like life, travel has its ups and downs but it's best to focus on the positive. I'm in Anchorage contemplating the first 8000 km of my journey from Ontario to Alaska and BC. I'm in a hotel room and it's the first time I haven't stayed in a tent in two weeks. There are the obvious big things that bring me joy like having a roof and knowing that my family and friends are healthy and safe but this post describes smaller things that made me smile. I knew the Lakeview Campground at Alaska's Tetlin National Wildlife Refuge existed but I didn't know it was going to be perfect! Not only is it free, it has sites right by a small calm lake with lots of wildlife and there's a great place to launch a kayak. Plus, it wasn't even busy! Heavy rain plus Manitoba backroads equalled one muddy car. I hoped that rains would clean it off before Dawson Creek, BC but that didn't happen. I learned my lesson last year about vehicle height with a kayak on the roof so rather than a car wash, it was the old-fashioned do-it-yourself powerwashing. So clean! I'll spare you the details of exactly how infrequently I shower while camping. Regardless, the first warm one in a while is so refreshing! It's a tight battle for the cutest baby animal. I really liked spruce grouse chicks in Alaska's Wrangell Mountains but these adorable baby moose near Anchorage were the best! The first week of my trip had lots of rain. It's a great feeling when you can turn off the wipers after they've been on continuously for hours (or days!). I got a big smile west of Edmonton when I saw it mentioned for the first time: "For Alaska Highway, follow Highway 43 North". Yes! I like it when the GPS has no instructions for more than 400 km as it does west of Edmonton. It's also cool when four digits are required on a distance sign as in Fort St. John when drivers are told that Whitehorse is in a mere 1342 km. Identifying birds by their song is hard. I've been learning to do so for a few years and it's a good feeling when that work pays off. I had two examples on a mountain road near Anchorage. 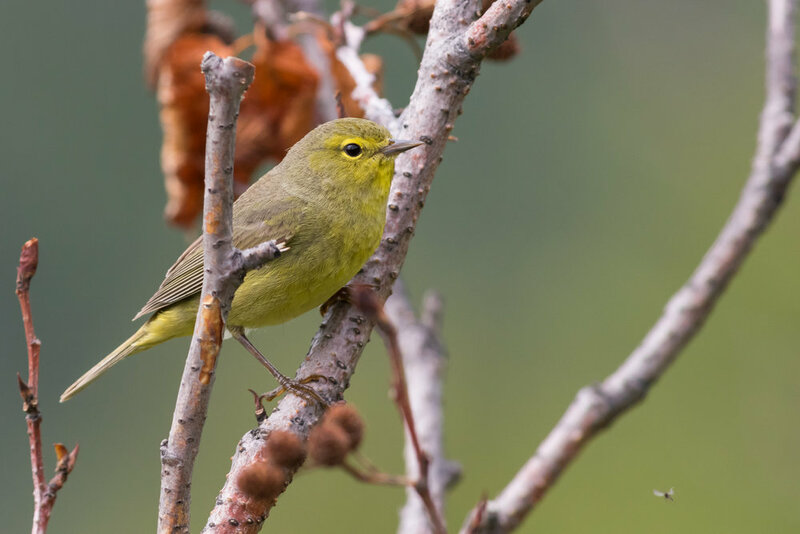 Is that high-pitched trill an orange-crowned warbler? Affirmitive! Is that plaintive call a golden-crowned sparrow? Confirmed! After filling up at least once every day for two weeks, what a great feeling today not visiting a gas station! I always seem to forget that you gain an hour as you travel west. Nice! Last week I paddled the edges of Summit Lake at Stone Mountain Provincial Park in northern BC. It's the highest point on the Alaska Highway and the lake was still mostly ice-covered. The ice chunks made such an appealing tinkling sound when they moved!